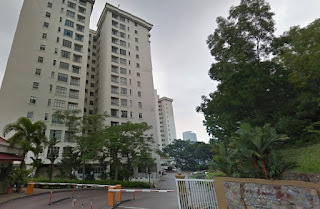 Sri Langit Condominium is a freehold condominium located at Jalan Taman Seputeh 7 in Seputeh, Kuala Lumpur. Sri Langit consists of two 12-storey condominium blocks with a total of 82 units. Each unit has a built-up area ranging from 2,880 sq.ft. to 3,200 sq.ft. Facilities at Sri Langit condominium include a swimming pool, gymnasium, children's play room, BBQ area, squash court and cafeteria. Built-up Area : 2,800 sq.ft. - 3,200 sq.ft.